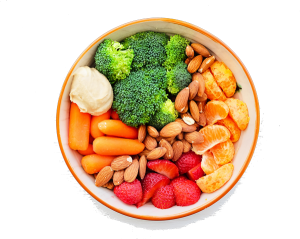 Eating healthy can be hard on a normal day, not to mention when you’re traveling and competing! Whether I’m at home or on the road, my approach to nutrition is to EAT WHOLE FOODS! Essentially, I try to minimize processed foods, cut out added sugars, and eat real food that comes from the earth. I’ve found that my body recognizes these whole foods and processes them in the appropriate ways, which maximizes my nutrient intake! For me, the biggest challenge traveling poses is being away from my own kitchen — which houses all of my favorite meal prep tools. That’s why I love staying in hotels or houses that have a partial kitchen or kitchenette because then I’m able to make the best of meals when traveling. Anytime you can prepare your own food, you’re more likely to eat clean. I also bring my own food while traveling! I don’t like to ever have to rely on airport or travel plaza food, so for me, the key is PREPARATION. I will even make full meals and bring them with me when traveling. And I always throw in healthy snacks that are easy to travel with, such as nuts or seeds, fruit, vegetables, etc. Both cut up or whole fruit and vegetables are very easy to travel with. Also, never forget your water bottle! Hydration is key and keeps me performing at my best despite the drain of travel. THE SCIENCE: The best way to prevent dehydration is to maintain body fluid levels by consuming plenty of fluids before, during, and after a workout or competition. Often, athletes do not realize that they are losing body fluids or that they are impacting their performance through dehydration. While I do like to experiment with local cuisines, I try to stay away from new foods when competing and prefer to stick to what I know helps me perform at my best! I’ve found that any time around competition is typically not the time to try new foods. If I buy local foods to cook, I try to stick to fresh ingredients. THE SCIENCE: When eating before competition, keep in mind that foods that are high in protein and fat will more than likely still be in the stomach, potentially causing stomach or gastrointestinal (GI) distress. Just like everyone else, I also enjoy a meal out every now and then! When I’m somewhere new, I look for restaurants that prepare foods in a healthy way, so that means minimizing the deep-fried foods or added sauces. Again, it’s all about choosing things from a menu that are fresh instead of processed. Freshii is one of my favorite places to grab a meal that is energizing and quick. I’m a sucker for any restaurant that has some version of a power bowl! A three-time Olympian in Women’s Ice Hockey, Meghan Duggan has helped Team USA bring home three Olympic medals, including a gold medal from the 2018 Olympic Winter Games in PyeongChang and silver medals from the 2010 and the 2014 Olympic Winter Games. She has also served as the team’s captain and helped secure seven gold medals and one silver medal by competing in eight World Championships over the course of her career.